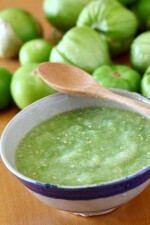 Tomatillo salsa verde (green salsa) is a fresh and very low-calorie appetizer or snack. This recipe is simple and fast to make. Add the blended mixture to a medium saucepan. Bring the mixture to a boil then reduce heat. Allow the salsa to simmer for 10-15 minutes. Transfer salsa into a bowl and allow to cool down to room temperature. This green salsa tastes great as a dip or on top of your favorite low-fat meat, potato or rice dish.